Another solo ride. I wanted to visit Cathedral Range again and try a few new things. I rolled out from home at 4am and hit the quiet roads out through Eltham and on past Christmas Hills all the way to Yarra Glen. Eltham Road, usually full of trucks and tourists, was dark and quiet. I kept rolling through Yarra Glen and made Healesville by 6:30am. 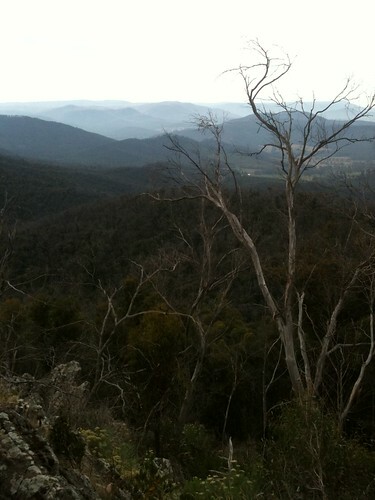 A quick water refill and I took off up Maroondah Highway onto the infamous Black Spur. Climbing Sugarloaf Peak. Not ridable. 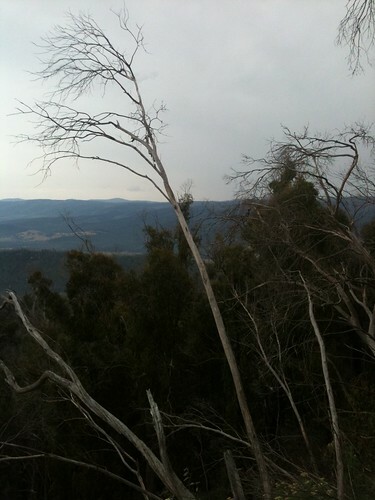 The Black Spur is a very popular tourist route through beautiful old growth forest. It’s about 30km long and in places it is winding, narrow, has no shoulder and a very steep drop-off down the side of the mountain. It’s one of the two most popular motorbike roads in Victoria (along with Reefton Spur) and, on any given weekend, you’ll see dickheads speeding on motorbikes and in cars dicing with trucks, 4WDs and slowpoke tourists towing wide caravans. There’s usually a large speed differential between vehicles and a lot of impatient veering across lanes around blind corners. I’ve always avoided riding on this road but it does happen to be the fastest way out to the Cathedral Range so I figured I’d give it a shot. Well, I can say that I felt completely safe riding the Black Spur on my pushbike at seven in the morning. I was riding outbound so most of the time I was hugging the mountain rather than teetering on the edge of the cliff. There was a little bit of traffic but it was infrequent enough that I could hear each vehicle coming and, I must say, all the vehicles I encountered were polite and gave me a wide berth. This included plenty of 4WDs towing boats and trailers, trucks and motorbikes. This was only possible because there was very light traffic in the opposing lane - if traffic was heavy then those vehicles may not have been able to give me space. Timing is everything and dickheads like to sleep in. Experiment number one : complete. Riding the Black Spur is fine if you get there early enough. 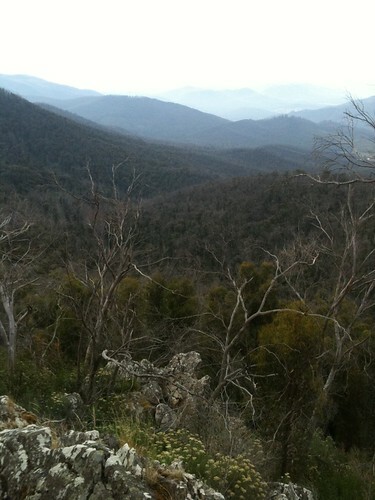 I crested the Spur and bombed down the other side past Narbethong and got down in the drops all the way to Buxton. Quick water refill at the caravan park and I headed back down to the southern entrance of the Cathedral Ranges off Mt Margaret Road. I took Cerberus Road and noticed some campers at Keppel Creek playing with a shotgun. I think they tried to get their dog to chase me. Nice. Cerberus Road became rough and rocky and loose and quite steep. I found my lowest gear and tried to keep the power going smoothly through the rear wheel so I didn’t spin out. 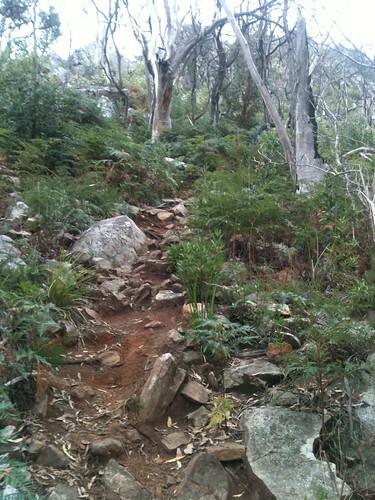 It was a nice steep climb all the way to Sugarloaf Saddle where there’s a carpark, toilet and picnic area. I had a little rest in the big gazebo thing and then started experiment number two which began with the stashing of the bike. I scouted around for a good hiding place and eventually settled on a spot just down the road from Sugarloaf Saddle. I wasn’t game to leave my bike at the picnic area even if it was locked. Paranoid? Maybe. But if someone messed with my bike it would have been a long walk home. So, I dragged it up a hill, lifted it through the bushes and hoisted it over a big log. I laid it flat, free locked it (more for deterrent than anything else) and, the final piece of overkill, threw some camouflage scrim netting over it just to be sure. It was pretty well hidden. Bike stashed, I unclipped the backpack from my porteur rack, pulled out my trail running gear and got changed for the next leg of the journey - straight up the side of Sugarloaf Peak to the highest point of the Cathedral Range. I’d dusted off my old trail running gear for this part of the “ride” but there wasn’t much running. It was a steep rocky hike up through the bush - definitely not ridable by any sort of bike - and I was sweating from the exertion. It did feel good to work some different muscles though and I was loving the scenery. And then it got really steep and rocky and it became more rock-hopping and scrambling than hiking. 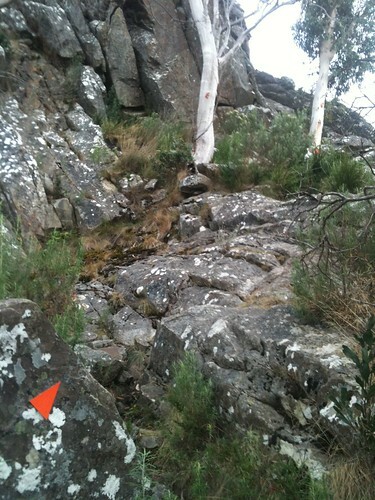 And then the “trail” went straight up between some huge rocks and I had no idea how to progress. I stood at the bottom trying to find handholds and see a line up through the rocks but, for the life of me, I couldn’t figure it out. It was frustrating. I kept going over it and over it - there must be a way up, what am I missing? But my fear of heights and lack of climbing skills had me dead in the water. 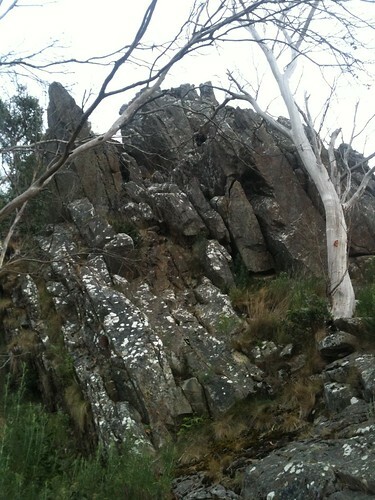 Reason kicked in - even if I did find a way up this steep pitch, how would I get back down it safely? I was alone so there was no-one to give me a hand or rescue me if I fell. Damn it! And then it started raining and that made me more comfortable with my decision to turn back. 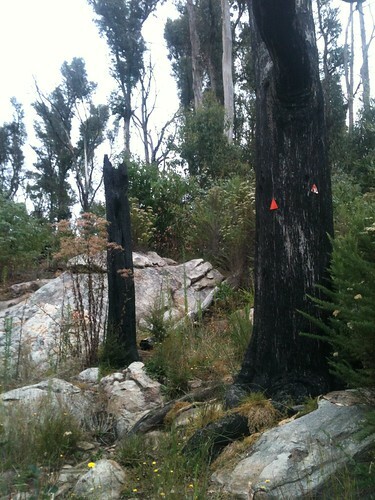 There were signs back at Sugarloaf Saddle warning against coming up here if it was wet. Lots of slippery rocks and steep exposed terrain. 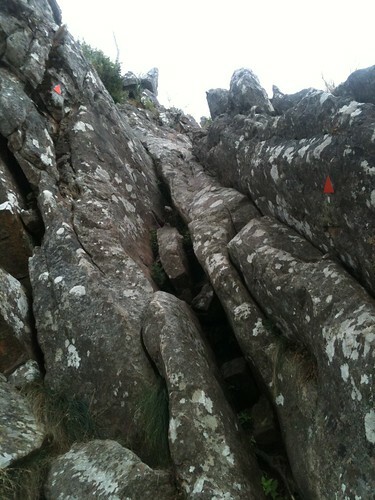 If I had managed to shin my way up to the top I would have had to come back down in the rain. Not smart. I probably would have got on the telly though, if they ever found my body. So, I snapped some photos and turned back down the trail. A lot easier and faster on the way down. I dragged my bike out of the bushes, got changed back into bike gear, clipped backpack onto rack and started bombing down Cerberus Road in the rain. Experiment number two : complete. Switching from riding to running worked well - could probably do without the scrim net - need to find somewhere with less scary (for me) climbing next time. This is a useful tool for reaching cool places inaccessible by bike. Limited, but useful. It was all downhill back to Buxton where I stopped in at the general store for coffee and sweet snacks. I didn’t hang around long, just enough to refuel, and then it was back onto Maroondah Hwy the way I came. It was easy road miles all the way back to Narbethong - there’s a reasonable shoulder along that stretch and the traffic wasn’t heavy. The rain eased as I turned off onto Plantation Road at Narbethong. I didn’t fancy tackling Black Spur in the rain in mid-afteroon on a Sunday so I’d planned to go back the slightly longer and more adventurous way through Toolangi State Forest. I’d ridden down Plantation Road before and remembered it as an awesome fun descent. It seemed longer this time when I was riding up it. In fact it seemed to go on forever. I span up it and eventually reached the intersection at the top. Nearly all downhill on Yellowdindi Road from here. A quick stop for water at Xylophone Bridge and then another climb up Sylvia Creek Road around the back of Mt Tanglefoot and then a long, fast descent all the way out of the forest and onto the blacktop of Myers Creek Road. Quick water and sunscreen stop at the tennis courts at Toolangi and then blacktop all the way across to Kinglake. I was getting the hunger so I zombied into the supermarket and came out with a can of baked beans and some chocolate milk which seemed to hit the spot perfectly despite a few scary milk burps. The rain had gone now and it was dry and hot so I took the descent down from Kinglake as fast as I dared and tried to remember Matt B’s descending tips. Good fast fun. After the descent it was rolling hills through St Andrews and Kangaroo Ground and back into the burbs at Eltham. Home stretch. I cruised on home through Eltham and shut the garage door just before 6pm. I tried two other different things on this ride. First was being more mindful on non-riding time. This meant no photos (except for a couple on Sugarloaf Peak), no toilet breaks every half hour and no general arsing around wasting time. I’ve asked myself before, “Where does the time go?” when I’ve attempted a long ride and hopelessly run out of time. Well, now I’ve got a pretty good idea where a lot of “the time” goes - it goes when I arse about off the bike, take a million bad photos, stop for a piss break every ten kilometres and do everything but actually ride my bike! Second other different thing I tried was food. I tried to take foods that would give me more bang (calories) for buck (weight/volume) and tried to leave out things which didn’t convincingly help me stay fuelled and happy. So, bagels and salada biscuits with vegemite and peanut butter, dried fruit, scroggin, oat bars, that sort of thing. I took a handful of gels but I’m happy to say I didn’t need to eat any. This is a Good Thing. ...and a brazillion other creatures of land and air whose names I do not know. And one final mention must go to... my well-loved and recently-retired Midge Bars. This was the first long ride I’ve done in years without them. They’ve been with me since the very first TWBD ride and I’ve held then in my hands through rain, snow, sun and wind. I’ve carried them to the ocean and to the mountains, through day and night, I’ve slammed them into the dirt and dragged them through the mud and endured endless curious questions about them from random cyclists on the street. Now it’s time for them to rest a while, in my garage, in the dark and the quiet. ...a brazillion is not a quantity, not matter how you spell it, just sayin'.